Rodney Willett's Blog: Here we go again! “She has this small girl with her but it’s not her daughter. The mother is visiting someone in Australia – or New Zealand – or somewhere. Now all we have to find out is who this is, who is the daughter, where are they and what do they have to do with the story.” That isn't a quote but boils down what Marcia has been saying for the last few days into one simple sentence. Simple? Well, not really. Still, that should be pretty easy – given the odd miracle or two – so why are we waiting? Well, we aren't We are getting on with it. Between us we have driven about three hundred miles this week in trying to find the answer. Not that we've found it. All we know now is that there are a few places where they aren't and a few where the definitely are not. There is a subtle difference: in the first case it means that there is no sign that they are there whilst the latter means that this is so wrong that there would be no point in even thinking about it. It is rather like when we were looking for a river. Not any old river but one particular river. If you remember we started looking in Cornwall and some weeks and many miles later found it by accident when we were up on Exmoor. Hey ho. To be fair, searching around looking for Marcia’s people has taken me to places that I would otherwise not know exist. It has made me realise just what a wonderfully rich part of the world the south west of England is. Having spent a part of my life as a travelling trouble-shooter I have made brief trips to may countries and they all have some spectacular scenery and fascinating wild life. Mind you, I seemed to spend more time in their industrial estates than I did in their countryside but even so I took whatever opportunities I could to have a good look around. There are many I would have loved to explore more fully but it seems to me that there are two sorts of explorers in this world (and most people are neither). There are the ones that want to visit as many places as they can and then there are the ones that want to know one area as intimately as they can. I belong to the second group and every time we go off I will see something new, something I have never noticed before. Also, as the seasons revolve I shall know where to look for old friends – early snowdrops, shy violets, the first bluebells and so on right through the year – and in some ways this is just as important as finding the new. 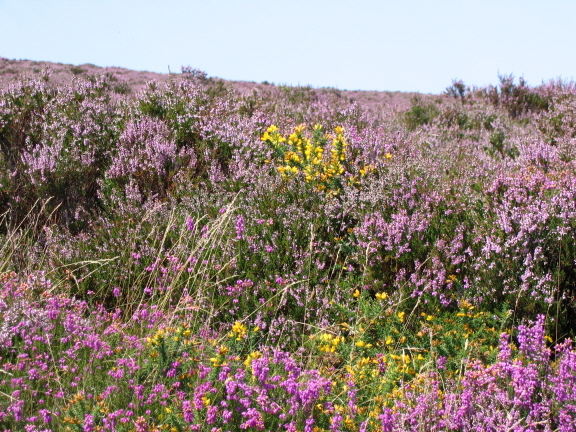 Gorse, bell heather and ling (the paler of the heaths). There is the whiff of autumn in the air. The wonderful lanes of spring have long since gone although there are a few places where there are good shows of wild flowers. Not entirely sure that I fully know why. On the open moors, the bell heather (Erica cinerea) is nearly over – what there is tends to be in the low clumps of gorse which is in flower at the same time – but the ling (Calluna vulgaris) lingers (and, before you ask, that is not why it has that name). It is also known as Common Heather or just Heather and is far paler than the bell heather but keeps going longer into the autumn. That’s about it for colour at the moment: the odd patch of wild flowers behaving badly and the gorse with the attendant heathers. Oh, and the rowan or mountain ash, which Marcia loves, is now covered in berries. Meanwhile we have the proper autumn colours to look forward to. Nothing as spectacular as they see in Canada, of course, but there is nothing lovelier than the Exe valley when the beech trees prepare for winter. Thanks to my brother-in-law, the puzzle of the moth has been solved. The problem was, of course, that we were looking at the underside so that the wonderful orange and red colours that adorn this animal were hidden. 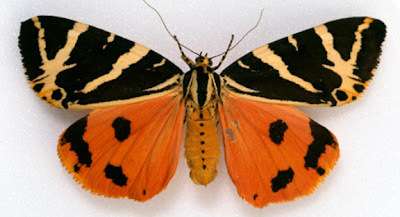 Anyway, all is revealed and what we were looking at was a Jersey Tiger Moth (Euplagia quadripunctaria). My thanks to the Natural History Museum for the following image. Beau - well it had to be, didn't it? To be scheduled: Waterstone’s. Truro and The Bookshop, Liskeard. I rarely suggest that Marcia's readers would be at all interested in my other blogs but the one I posted today - Friday 13th - may be an exception. If you want to see what I am talking about, please CLICK HERE. This post is called 'Three Crows'.